Flatbreads are baked on the same day that they are mixed and in the summertime, yeasted dough takes no time to rise and freshly made bread can be ready in a matter of a couple of hours. Any of these flatbreads work well with Middle Eastern Bean dishes (eg: fuhl). Pita dough can also be shaped in thickish rounds, baked (use the barbecue!) and used in place of hamburger buns. Put yeast into a small bowl. Add lukewarm water (test on your wrist to make sure it isn’t too hot) and stir till the mixture is creamy. Put oil, honey and the rest of the water into a largish bowl. Add both flours and the yeasted water. Stir with a wooden spoon until a rough dough is formed. Cover the bowl and let it sit for about 20 minutes. Turn the dough out onto a lightly flour board. Sprinkle salt overtop. Knead for about 10 minutes til the dough is smooth, silky and springy. Put into a clean bowl (there is no need to oil the bowl) that is large enough for the dough to triple. Cover and let rise on the counter (draught free) til the dough has doubled. If you are using the oven to bake the pita: 30 minutes before baking the bread, put baking stone on the middle to lowest rack of the oven. Turn the oven to 500F. Using a wooden rolling pin, roll each ball into a flat disc - about 6 inches in diameter and ⅜ inches thick. Make sure the finished discs are lightly floured before stacking them. If you are using the barbecue: Preheat the barbecue to high. Place each disc directly on the grill. Close the lid of the barbecue. Cook for about 2 minutes or so on one side. Using tongs, turn over when they have puffed. Continue to cook on the other side til they seem done. (complete baking takes about 5 minutes) Put the finished pitas into a basket. If you are using the oven: Place the discs directly on the hot stone. Bake the bread at 500F for about 5 minutes or until it is lightly golden and puffed. (It really does take only 5 minutes.) You might want to turn the bread over half way through cooking but it isn't really necessary. To blog from OUR kitchen - pita, pita, who wants pita! "Do not get disheartened [...] you will improve with practice." We went to our local India town to get the tava and wire rack. They are not very expensive items. You can probably use a flat heavy griddle in place of the tava. In a bowl, mix flours and salt. Add warm water gradually, stirring with a fork until you have a soft dough. The amount of water will vary drastically depending on air temperature and humidity. You just have to play with it. I think (but am not certain) that the softer the dough, the softer the finished rotis will be. Using as little extra flour as possible, knead on a board for 8 minutes until the dough is soft and silky. Place dough back in the bowl. Cover with a damp cloth or plastic and let sit on the counter for 30 minutes to one hour. Put the tava on medium heat. Do not oil it. Put the wirerack on another burner at the highest heat possible. Cut the dough into 8 equal pieces. Lightly flour each one and put 7 pieces back in the bowl. Cover the bowl. Form the piece of dough into a ball and flatten it. Roll it out into a round til it is quite thin but not too thin (this is again is one of those infuriating things where you will just have to practice to find out what thinness works best for you) - about 1 mm?? As you roll out the dough, make sure it is not sticking to the board and that there are no holes. Keep the rolling pin lightly dusted with as little flour as possible and the board the same way. Put the finished bread on a serviette covered warm plate. Cover with a lid. Keep the plate in a warm oven. Roll out the next piece of dough and repeat til you have 8 rotis. Turn the finished rotis over as you put a new roti on the stack. N.B. 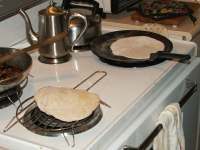 Traditionally, chapatis are made with atta (finely milled 100% whole wheat flour). If you have access to atta, do use it � measure for measure in place of the unbleached all-purpose and whole wheat flours listed above. The resulting chapatis are amazingly soft and pliable. We love to have this bread with green chili omelettes or Palak Paneer (spinach and cheese). You can also use it in place of tortillas in Mexican Pie. In place of the whole wheat flour, use finely ground corn meal. This is not exactly like a recipe for tortillas but it is a reasonable facsimile for corn tortillas. Corn tortillas use only corn flour (masa harina) and have no wheat flour at all. They are quite different from flour tortillas. While this version of corn tortilla is NOT really correct, it amounts to the same thing in our unsophisticated minds. In a small bowl, add the yeast and some of the sugar to lukewarm (do the baby's bottle test on your wrist). Whisk together until creamy. Set aside. Cut the butter into pieces in a bowl large enough for the dough to triple (I use a large casserole dish). Add boiling water and stir til the butter is melted. Add the yoghurt, salt, and rest of the sugar to the butter water. Using a wooden spoon, stir in whole wheat flour and all but ½ c allpurpose flour. Doublecheck that the dough is no warmer than baby bottle temperature, then add the yeast mixture to the large bowl. Stir just enough to mix it together. Cover (plate, lid, plastic wrap) and leave on counter for about 20 minutes (or not). Turn the dough out onto a lightly floured board (use some of the leftover ½ c flour). Let the dough rest as you wash and dry your mixing bowl. This prepares the rising bowl AND gets your hands clean. Kneading: Knead the dough 5 to 10 minutes, adding small amounts of what's left of the � c flour to the board if dough seems sticky. (You don't have to use up all the flour.) When the dough is smooth and silky to the touch, it has been kneaded enough. Proofing: Put the dough into the clean dry bowl that holds three times the volume of the dough. Cover the bowl and allow to rise in a non-drafty area at room temperature (or in the cold oven with only the light turned on) until the dough has doubled. This might take anywhere from an hour to four hours - the cooler the area, the longer it will take. Plan ahead. It's BETTER when it takes longer to rise. A good way to tell if the dough has doubled is to wet your finger and poke a hole in the top of the dough. If the hole fills up, it hasn�t risen enough. If there is a whoosh of air and the dough deflates a little, it has risen too much. If the hole stays in exactly the same configuration and the dough remains otherwise intact, it is ju-u-st right. 30 minutes before baking the bread, put baking stone on the middle rack of the oven. Turn the oven to 500F. Fill a small bowl with COLD water and put it near the board. Notes: In the summer, I mix the dough around 2 or 3 PM and it has risen by about 6PM. In winter (our kitchen is ridiculously cold), I mix the dough in the morning and it's ready to shape by evening. I haven't tested this but I can't see why you couldn't mix and knead the dough in the late evening and stick it in the fridge overnight to rise so you could bake it in the morning to have with green chili omelettes. If you try this, leave it out on the counter for at least 30 minutes before putting it in the fridge and then bring it out and let it come up to room temperature before shaping (probably would do that in the time that you are preheating the oven). 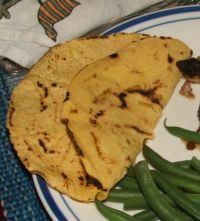 Naan can be baked on the barbecue and/or also be shaped in thickish rounds before baking and used in place of hamburger buns. adapted from recipes in "A Taste of India" by Madhur Jaffrey and "Entertaining Indian Style" by Shehzad Husain. This really is the most fabulous Focaccia. It is dead easy to make and I highly recommend it. 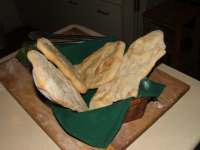 July 2007: For thinner focaccia, allow for about an hour's rising time after shaping the bread. For thicker focaccia, allow for about 3 hour's rising time after shaping the bread. In a smallish bowl, mix yeast with ¼ c lukewarm water (do the baby's bottle test on your wrist) and malt powder if using. Let stand as you mix the other ingredients or until it bubbles (5 to 10 minutes). In the meantime, put the room temperature water and oil into a large mixing bowl. Add whole wheat flour ½ c at a time. Stir well with a wooden spoon. Add the salt and only as much unbleached allpurpose flour as you need to make dough pull away from sides of bowl (I use 2 c.) Add the whole wheat flour, salt and 2 cups of the unbleached allpurpose flour (just enough to make dough pull away from sides of bowl). Stir well with a wooden spoon. Put about ¼ c Sprinkle a small amount of the remaining allpurpose flour on a wooden board. Turn the dough out onto the board. Let the dough rest as you wash and dry your mixing bowl. for thinner focaccia: Stretch and pat the dough on the baking sheet to roughly form a 12x12 inch square. Place some thinly sliced onions on half the bread and press them into the dough. Cover the pan with a damp cloth and let the dough rise again for about 45 minutes. for thicker focaccia pre-shaping: Cut a piece of parchment paper to fit a large jelly-roll tray. Oil the parchment and place the dough in the center. Use your fingers to gently stretch it towards the edges of the pan. It will try to bounce back. This is to be expected. When it's almost to the edges, cover with a clean dish towel and allow to rest on the counter for 30 minutes. Half an hour before baking, preheat the oven to 450F. for thinner focaccia: Make indentations with your fingertips about every 2 inches, dimpling the dough all over. (this was very pleasing to do) Sprinkle fresh rosemary needles into the indentations. (I did this on the non onion half of the bread) Drizzle the dough with 2 Tbsp olive oil. Bake for about 20 to 25 minutes, or until golden (I think I baked it about 40 minutes but checked it after 25 and then every five minutes after that). To ensure that the bottom crust stays crispy, take out of the pan immediately after the bread is done and store it on a rack. Serve warm, cut or broken into pieces. for thicker focaccia: Place the focaccia tray on the top shelf of the oven and immediately turn the oven down to 400F. Bake for about 20 minutes til golden. It's a good idea to turn the tray around half way through the baking time - to allow for uneven oven heat. Remove from pan to a wooden board and slice with a pizza wheel. Serve immediately. Focaccia can be baked in the barbecue as well. Preheat the barbecue to medium high heat. Place the pan on the grill and close the lid. After about 5 minutes, check to make sure the bottom is not getting too brown. Keep checking from time to time... If it seems like the bottom is cooking faster than the top, flip the focaccia over, close the barbecue lid and continue cooking. Focaccia dough can also be shaped in thickish rounds, baked and used in place of hamburger buns.